It’s a little-known fact that in our early years we piloted a mentorship program for boys. While the program did not yield our desired results and was ultimately wound down, it did bring us Hector, who is now an accountant working with our operations team at the MAIA Impact School. Hector was one of the few who stayed in the program and graduated from high school. Hector is just 22 but is already proving his potential. He is well on his way to achieving MAIA’s four goals: lifelong learning, economic autonomy, a family on his terms, and empowered to empower. No, this has nothing to do with Romeo and Juliet. Contrary to what Romeo thinks, there is a lot to a name. How we choose to identify ourselves is a reflection of ourselves. Maia, as one of the giant stars in our universe, reflects our central objective: to empower Girl Pioneers to be transformational leaders, with ideas, values, and dreams of their own that shine brightly and positively impact their community. Above all, the star is a symbol of knowledge and wisdom. I know that with my knowledge and my voice, I am a leader. I can use what I know not only to benefit myself and my family, but also to support my community. I can go far beyond the obstacles that I faced, and if I can do it, I know that it’s possible for the people in my community—they just need support. Graciela’s belief in herself and other women has taken her much further than she ever imagined. Read her story of empowerment and the work she is doing now to empower others. Having a teacher with shared life experience is a valuable part of an enriching education. It’s even more important when they speak the same language that students speak at home with their families, when they have overcome similar challenges, and when they understand the cultural and social norms that their students are living within. It demonstrates to students, who previously might have been unsure of whether or not they would even stay in school, that they are capable of graduating if they dedicate themselves to that goal and seek support. It encourages the “if you can do it, so can I” attitude. World Teachers’ Day reminds us that the right to an education means the right to a qualified teacher. Impact School educators stand before the class as role models, demonstrating the importance of high-quality instruction and support for students. When students are well supported by their educators in an academic environment that encourages them, challenges them, and causes them to grow, they can begin to dream of how they can do the same for others. Education has the power to transform lives. Teachers can have a profound influence on their students through their instruction, and the lessons learned within the bounds of a classroom are critical. Yet, we also recognize that the teachers of life’s important lessons are found outside the classroom as well. I want to show my parents and my community that I am a woman, that I have dreams, and that I can achieve many things in my life. I want to create positive change in my community. I know it will be difficult, but I believe in myself, so I know that it is possible. I want to bring joy to my parents, especially to my mother, who has shown me what it means to be a strong woman. When I finally learned to say things like “I do not agree with this,” “My opinion is,” and “If you gave me the opportunity to prove what I am capable of,” my life changed completely. Then, through my voice, I got scholarships to continue my studies. I spoke up for raises where I worked. I denounced acts of corruption. MAIA helped make the trip a success from the beginning. Everything I learned at MAIA, like the values and competencies, was put into practice right away. All of the themes that my mentor taught me were helpful. I used critical thinking, teamwork, and perseverance. I was resilient, responsible, and respectful. MAIA has given me many learning opportunities that have helped me in my life. Stand With Girls. Become Their Ally. The Alianza Program is an opportunity for you to invest in the future of Girl Pioneers (starting first with MAIA Impact School students) while also getting to know them through a variety of meaningful activities designed by mentors and the young women themselves. What do you think of when you hear the word “culture”? Your mind may have just drifted to the food, language, or clothing of a particular group of people. Celebrating indigenous Mayan culture is a very important aspect of the Starfish Impact School. The school is designed to provide young women with a high-quality education in a space that encourages authentic and profound connection to the values of Mayan culture. Starfish mentors are a critical part of providing this comprehensive support. They get to know each Girl Pioneer, accompanying her at the familial, personal, and educational level through home visits, individual coaching sessions, and meetings with her Impact School educators. A mentor’s goal is to help each Girl Pioneer work through her emotions and teach her how to navigate challenges, while still working to achieve her goals. As MAIA Girl Pioneers blaze new trails, the support of their families is a critical part of their education and success. Throughout their lives and educational journeys, the mothers of Girl Pioneers make a significant impact on their daughters. This Mother’s Day, Girl Pioneers honored their mothers by sharing how their moms support them in their education and why they value their mother-daughter relationships. My mom supports me in different ways so that I can concentrate on my education. She is one of the people who motivates me day by day. She does everything possible so that I can do my homework. I also receive economic and moral support from her. She is an understanding, hardworking, and unique woman. She always fights for the good of her children. She is very responsible, respectful, and humble. I value these qualities so much because I think she has taught me to be like her. [I am proud of my mom because] despite the fact that she did not have the opportunity to go to school, she is conscious of the importance of education for us (her children). My biggest dream for her is that she would form the habit of reading because she is someone who is fascinated by the adventures of other lives. [I also dream] that she would accomplish her dream of launching her business that will benefit other women. My mom supports me in different ways, such as my studies. She supports me mentally because she always encourages me to continue moving forward with my studies. Sometimes when I [sleep late in the morning because I] am tired from my homework, she wakes me up. She also supports me with the breakfast and lunch that I take to school. The things that I value about my mom are her efforts because she is always there to support me if I encounter an obstacle. I also appreciate the love that she gives me. She always says, “Things must be done calmly.” I value her words a lot because not all mothers say that. I value the work that she does to keep my family moving forward. I feel proud to have a mother who is peaceful, responsible, and, above all, loving towards her children! I am proud to have a bold mom because if she has goals, she achieves them through a lot of dedication. My biggest dream for my mom and her future is that she will feel proud of her daughter because she will be graduating from university and a professional. In this way, I can help take care of her and protect her. [I also dream that] she will have good health so that she will be able to live with my family for a long time. [My mom supports me in my education with] economic support, and helping with daily problems and other academic work, even if it is helping me to paint, cut, and/or draw. Sometimes when I don’t have time to cook, she makes me something to eat and brings me atol (a traditional Guatemalan corn cider) if I am doing homework. I value her advice, love, effort, and the support that she has always given me. Even though life can be painful; it is beautiful at my mom’s side. I feel proud of her because she has taught me how to work and dedicate myself to my studies. Above all, [I am] proud to have an innovative, intelligent, hardworking, and entrepreneurial mom who perseveres, and it makes me happy. How has your mother played a vital role in your life? What do you value about the mothers that you know? In honor of the important women in your life, you can support Girl Pioneers and their mothers who are helping to shape their experiences. 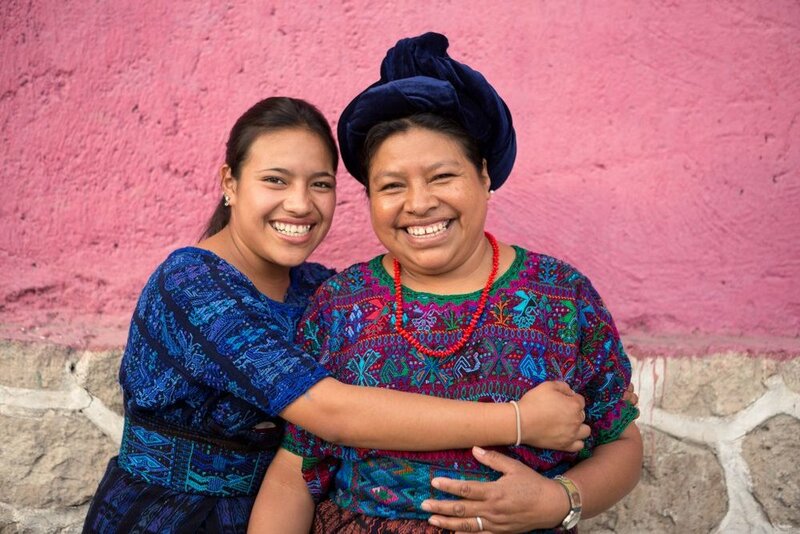 Give today and partner with MAIA moms who are raising their daughters to be empowered leaders. We believe in the importance of giving Girl Pioneers female role models from all over the world who they can look up to and emulate at the MAIA Impact School.